AudioGO, 2011. First published in the United Kingdom in 1953. 6 hours, 50 minutes on 6 compact discs. 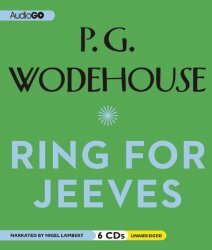 A Jeeves book without Wooster! I have stooped to checking out any P. G. Wodehouse book our library has in audio form, without trying to read them in order. This one was written in the 1950s when the British aristocracy was in trouble. Sir Rochester, Rory, works at “Harridge’s” to make ends meet, and Bill, the ninth Earl of Rowcester (pronounced “Roaster”) has been working as a bookie, with Jeeves as his clerk. Jeeves? Why is Jeeves there without Bertie Wooster? Well, Bertie is going to a school where he’s learning to get along without servants, doing things like darning his own socks. And gentlemen’s personal gentlemen are not allowed. Meanwhile, Bill’s bookmaking activities get him into a grand mesh of trouble after an unlikely bet pays off – or should pay off. He was operating his business in disguise and trying to keep it secret from his fiancée, Jill Wyvern, a veterinarian. Meanwhile, Bill’s sister, Rory’s wife, has met a rich American widow who would love to buy Rowcester Abbey, especially if she can find evidence of any ghosts. But her friend happens to be the man who won the bet that Bill didn’t pay. Can Bill keep his secret? Can he sell the old house? And can Rory keep from telling the American everything that’s wrong with it? This book is the usual good fun of a P. G. Wodehouse tale. I didn’t enjoy this narrator as much as the ones I’ve heard narrating the other books. Although he has a lovely English accent, his voice of Rory – or anyone getting very excited – was quite annoying to listen to. But that was minor enough to not diminish my overall enjoyment of the yarn. I always say there’s nothing like a good laugh on my way to work. This entry was posted on Monday, January 26th, 2015 at 2:53 am and is filed under Audiobooks, Fiction Review, Humorous. You can follow any responses to this entry through the RSS 2.0 feed. You can leave a response, or trackback from your own site.